Cadettes will fulfill three of the five requirements to earn the Animal Helpers badge at this workshop. During this workshop, the Cadettes will tour the MCRD Museum to learn how animals have helped the U.S. Marines throughout their history. The Cadettes will create a comic or a movie on iPads to demonstrate what they learned. Next, subject to availability, Cadettes will meet and interact with Therapy Dogs and their handlers, to learn how animals help people emotionally. Finally, subject to availability, the Cadettes will observe a K-9 demonstration put on by MCRD's military police, to show how working dogs help the Marines. Other family members are welcome to attend the workshop. Attendees are allowed to pet and take photos with the Therapy Dogs. Attendees are not allowed to pet the military working dogs. If a child or adult is afraid of dogs, we do not recommend they observe the K-9 demonstration. The K-9 presentation by the military police and the Therapy Dog session are subject to the availability of the staff and volunteers of those organizations. Every effort is made to schedule these two events for the workshop. For the Power of One award, Juniors will learn about a female Marine officer who served during World War II, Charlotte Gower. Ms. Gower also held the distinction of being the only female Marine to have served with the OSS (the precursor organization to the CIA). She was also a University professor, a Dean of Women's Studies, and a former POW (prisoner of war) during World War II. Juniors will explore the amazing life of Charlotte Gower and compare her character with theirs. During this award workshop, Juniors will interact with World War II museum artifacts and create a movie about Ms. Gower's life. Other family members are welcome to attend this workshop. 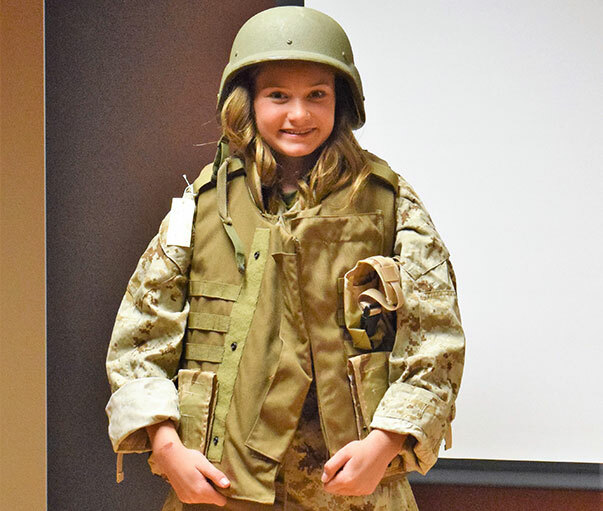 Brownies will learn about Marine Corps symbols, songs, and celebrations during this merit badge workshop. This workshop will fulfill four of the five requirements to earn their Celebrating Community badge. Brownies will come to the MCRD Museum and learn about the Marine Corps emblem and the Marine Corps mascot. They will tour the museum, a landmark that honors the past. Brownies will learn to sing the Marines' Hymn and later they will hear the Hymn played when they attend a ceremony held on MCRD, featuring a Marine Corps Band! Subject to availability, Brownies will meet the MCRD mascot, a bulldog named Smedley. The ceremony will be held on the Parade Field on MCRD. The ceremony lasts approximately 1.5 hours. Smedley, the MCRD mascot, is a very busy bulldog. He loves to meet Girl Scouts, but occasionally his schedule does not permit him to meet with all visiting groups. He will do his very best to greet you if you attend this workshop!